But why pay more than you have to? A complimentary booklet is available that shows you how to avoid issues with your retirement assets and avoid confusion for you and your beneficiaries. 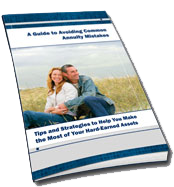 This complimentary booklet also creates awareness around the most common and costly annuity owner concerns and provides tips and strategies to help you make the most of your hard earned assets. Fill out the form below for your complimentary 16-page booklet!! This article is designed to provide general information on the subjects covered. Pursuant to IRS Circular 230, it is not, however, intended to provide specific legal or tax advice and cannot be used to avoid tax penalties or to promote, market, or recommend any tax plan or arrangement. Please note that Ron Caskey does not give legal or tax advice. Please consult your tax advisor or attorney.